There are no tears now. The weeping ended a long while ago, leaving behind a heavy but mute sorrow. Not one, nor two, but three of D.M. Nadira Harshani’s four children are autistic. As if this overwhelming burden is inadequate, the father of her children has abandoned her for another woman. It is on a cloudless, humid afternoon that we arrive at the appointed time at Harshani’s home at Welsiripura, Madiwela, Kotte, bypassing posh houses with huge gardens and ending in a shantytown straggling beyond a canal. Her neighbours are firstly suspicious and then welcoming, even inviting us into their houses, with the woman living opposite Harshani’s home showing us a boy of 15 through the window. It is Harshani’s eldest son, Kavindu Deshan Rajapakse, who on turning 15 has had to leave the Special Education Unit of St. Thomas’s College, Kotte, as the rules state. The day of our visit, Harshani has pleaded with her neighbour to look after Kavindu while she has gone to school to bring back her other two sons, Sahan Anjuka, 14, Avindu Bimsara, 12, and daughter, Rashmi Himansa, 8. Otherwise, she would have to take Kavindu, tagging along too, for he cannot be kept alone in their home. While the neighbour is awaiting Harshani’s return, murmuring that the latter is late and she needs to go to the kade (boutique) to buy some rice which has to be cooked for lunch, we watch through a wooden window Kavindu, blind in one eye, drinking water from a bottle like a small child, spilling it all over his chest. It is after a long while that a trishaw draws up a little distance away from Harshani’s home and out step mother and three children. Strangely, she is not holding tight to her youngest daughter, Rashmi, but to the bigger boy, Sahan. She collects her eldest son from her neighbour and the family enters their home, after unlocking and pushing and shoving the front-door with difficulty, as it seems stuck, inviting us in as well. We enter into a world of chaos, a dark and dingy home, with clothes given by others piled high. Sahan who is worst-affected by autism is clamouring for “beema” (a drink, made from cordial) which is shared generously with us. While we sit and chat, Sahan is monopolizing the photo-journalist, hugging him, spilling beema all over him and the house and climbing onto his shoulders. Fortunately, for Harshani, although her husband has abandoned her and is refusing to pay her much for the upkeep of the children he has fathered, even though he owns a boutique, her mother-in-law who engages in the redi (cloth) business, has allowed Harshani to use her home as a roof over their heads. She lives with the family and gives a little money for the running of the house. “This house belongs to my mother-in-law,” says Harshani, ever-grateful to her, as otherwise she and her children would have to be on the street. Harshani’s life epitomizes that of many a family with a special child to care for. Against massive odds, which she has accepted with stoic resignation, it is a daily battle for survival, while attempting to give a semblance of an education to her children. She is compelled to pay Rs. 150 one-way for the trishaw as otherwise she has to take all four children by bus, lugging their heavy school bags with them, while gripping onto Sahan tightly. The two middle boys have to be put in pampers, otherwise it would be a disaster waiting to happen. When she returns after taking them to school, it is a hectic routine of washing clothes, an attempt to bring a little order into the home, cooking lunch and taking off to bring them back from school. After lunch, she has to sit with them, while they laboriously do their homework, simple things like cutting pictures, pasting them etc. taking wearyingly long hours. Harshani cannot find regular work even for half-a-day because she cannot leave the boys alone, untended. As her daughter grows up she is also fearful about the girl’s future. future is something Harshani does not want to think about. Even while the “watte kattiya” who are her neighbours call her children “anga vikala” (retarded), Harshani has accepted her “pera karapu karume” (fate or karma) and soldiers on. Her next challenge is to find a place where she can get vocational training for her eldest son, who is now out of school, so that he can find some work thereafter. Harshani is awaiting the end of the Aluth Avurudu holidays, before she begins her arduous search. For her, avurudu is just another day – the difference being that with the school holidays on and the rush of the routine not being there, Harshani has more time to crease her brow in worry, wondering what the future holds for her children. Taking up the situation of Harshani and her family, as just one example of the tragedy faced by numerous families with special children in Sri Lanka, Consultant Child and Adolescent Psychiatrist Prof. Hemamali Perera goes back in time to the birth of Harshani’s first boy, when the system should have got activated to advise her on her future course of action, while supporting the family. Prof. Perera speaks with much experience not only as a Consultant who served at the Lady Ridgeway Hospital in Colombo but also seeing the crying need, was instrumental in setting up the Sri Lanka Association for Child Development in 2012, with like-minded people. 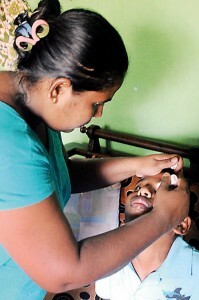 “In an ideal situation, there should have been recognition at the primary care level under the Medical Officer of Health (MOH) and the Public Health Midwife of the developmental problem with Harshani’s first child, as it is at that level that all aspects of development need to be checked,” says Prof. Perera. Reiterating that there is a vital need to developattitude, knowledge and skills at the primary care level, injecting new vigour to spot cognitive development milestones as well and an assessment at serial intervals, she points out that when primary care workers suspect something not being right, there should be a referral, as early as possible, to the right services for thorough screening for development disabilities. As in the case of Harshani, when the development disability is genetic-related, there should have been a system which would have advised her and her husband about any pregnancy thereafter. Commending the early childhood service with its good infrastructure of which Sri Lanka is very proud of and boasts about, Prof. Perera points out that to strengthen it there has to be strict supervision and monitoring to ensure quality. For in the case of every newborn, able or disabled, it is primary healthcare that should play a pivotal role. Referring to the development disability of autism alone, she points out that a study carried out by her indicates a ratio of 1:97, but it could be more. If we calculate for prevalence on average, every year more than 4,000 children with autism enter Grade 1. Questioning what has happened to the proposed “very well structured” National Programme for Child Development put forth by the Family Health Bureau, she said that there was a lot of discussion last year but nothing has come of it. Under this ‘National Programme’ every child was to be monitored for all development milestones at 6 months, 1 year, 18 months and 24 months at the MOH clinics, with any child with the slightest indication of a developmental problem being referred to and followed up at a Primary Child Development Centre. Citing the example of a child suspected to be having autism, there would be an intervention by a multidisciplinary team of experts which would include a Paediatrician, a Child Psychiatrist, an Occupational Therapist etc. “It would not end there,” says Prof. Perera, with the process continuing and even the education authorities extending their support. Explaining that a vast majority of autistic children can be integrated into mainstream education with some support, she says that they are intellectually capable but because of their autistic traits do not understand the classroom environment. Teachers and peers have to relate to them, but need extra skills to do so. The Primary Education Section of the Education Ministry has taken steps to train in-service assistants (ISAs) to be based in zonal offices going into schools to recognize the needs of these children and support the teachers in an inclusive education environment. “But there are a few issues, large classroom numbers being one,” says Prof. Perera, pointing out that the teachers should have a good knowledge to deal with these children, while the ISAs provide individual support to the child, with the teacher and the assistant working in tandem in the classroom. Meanwhile, the education service should have education psychologists and also speech and occupational therapists attached at district or provincial levels to provide that extra service. “Now, however, the easy way out is for such children to be sent to the Special Education Unit, which is a great disservice to them,” she stressed, showing a different way. The primary section in a school should have a learning support unit for some of the subjects, where these children will go to, but all other activities should be with the main group in the class. “Then other children also play a role, helping these children. It is a two-way process, looking after and helping builds up social sensitivity,” says Prof. Perera, adding that educational research clearly shows that there is also a benefit to normal children who work with special children in the same classroom. The family, meanwhile, needs support from a social network. Every Divisional Secretariat already has a social-care team comprising a Child Rights Promotion Officer, a Probation Officer, an officer from the National Child Protection Authority, a Women’s Rights Officer, set up soon after the tsunami. These could be mobilized to help families with special children, while also providing them more social benefits, on the recommendation of the Grama Niladharis who should be empowered to be more sensitive towards them. Her dream, if she can own a machine, is to do some sewing and sell a piece at Rs. 8 each. “I will work late into the night, because I put my children to sleep at 8 p.m.,” she says. All those generous people out there, who wish to help Harshani and her children, could send a small donation to her bank account: 279200160002864, in the name of D.M. Nadira Harshani, at the People’s Bank, Pita Kotte branch.